During the browser wars of the mid to late 1990s many initially had their money on Netscape to win as Microsoft were mostly playing catch up. However the sheer monetary might of Microsoft soon told and at the turn of the century Internet Explorer was used by 96% of web surfers. I am sure that when the developers of Netscape fragmented and announced that they were working on a new browser, Microsoft were hardly shaking in their boots. After all by 2002 Netscape was effectively dead, although it took several years for Netscape to realise this. However it wasn't long before Microsoft once again underestimated the browser market and announced that they would no longer be updating their browser after IE6, instead stating that IE would be updating only when new versions of Windows Operating systems appeared. Indeed Microsoft's IE6 came out in 2001, IE7 at the end of 2006, about the same time as Windows Vista. A lot had happened in that time and Microsoft had left themselves once again with a lot of catching up to do. In the same time Mozilla had released 3 versions of their new Firefox browser and made tabbed browsing, search boxes and Extensions/Add Ons the way to go. The browser wars have been raging again ever since. 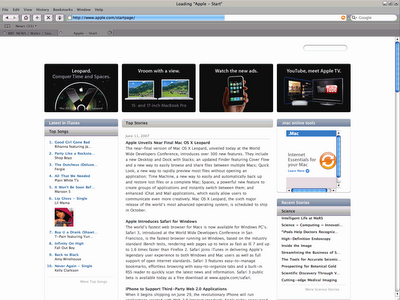 Apple joined in 2007 with Safari and Google at the end of 2008 with Chrome. 2009 has been a great year in terms of web browser development, Firefox released version 3.5 of their browser, Apple version 4 of Safari, Microsoft IE8 and even Google updated Chrome. With the greater choice this entails, it seems that many people are jumping ship and swapping browsers. Today, Internet Explorer has just 59% of the browser market, the lowest for more than a decade. This is despite the recent release of IE7 and IE8. Firefox has shot up from about 5% in 2005 to now account for about 31.2% of the browser market. Even new boys like Safari and Chrome have overtaken Opera (1.56%), with 4.07% and 3.3% respectively. What is apparent is that despite the release of IE8 this year, Microsoft have still lost almost 10% of their market share in just 6 months. This trend is only likely to continue, especially as Microsoft have announced that in Europe, they won't be releasing Windows 7 with Internet Explorer, or any browser for that matter. Giving much more incentive to switch to Firefox, Safari or Chrome. Although IE still has around double the market share of Firefox, its closest rival, it is much closer when the browser versions themselves are compared. IE7 had 45% of the market share at the start of the year, now it is down to just 29%, with Firefox 3 right behind at 25% (up from 20%). Of course many of those who stopped using IE7 switched to IE8, but not all of them, clearly some are moving to Firefox. If more make the switch from IE7 to either Firefox or IE8, then, for the first time in more than a decade, Internet Explorer will no longer be the world's most popular browser. Web surfers have never had such a rich choice, nor such a rich browsing experience as they have right now, and things look as though they will just keep getting better. Microsoft will cushion you from the Internet Explorer 8 standards mess with software to prevent automatic download of its next browser to your machine. Ask any web designer what their least favourite browser is and it's a good bet that Internet Explorer will be their reply. It isn't because of some anti-Microsoft sentiment, or because it isn't as cool or as customisable as other browsers, nor even anything to do with page loading speed, but quite simply because it doesn't follow the official W3C web standards. Microsoft acknowledges this problem and since Internet Explorer 6 (IE6) has been working to bring its browser into line with W3C specifications. The browser wars of the 1990s between the now defunct Netscape Navigator and Internet Explorer started off this problem, as each browser began following only some standards, or worse, only following their own standards. Surprisingly, back then it was Microsoft's browser that was the most standards compliant, and Netscape that used its own 'standards'. By the time that IE had won the browser war and was used by 96% of web surfers, it too had moved onto supporting its own proprietary standards. At this point it wasn't too much of a problem, as web designers could simply design for IE, as it was a fairly safe bet that most of the viewers of a website would be using it. It wasn't all rosy however, the browser war had meant there had been a stagnation in bug fixes and actual development, web designers were stuck designing in lengthy, bloated code as the slicker design method of HTML and CSS didn't work properly with Internet Explorer. Cascading Style Sheets (CSS) were meant to make the design process far, far easier and also make the viewing of web pages faster and more aesthetically pleasing. Web pages using CSS load faster, are easier to alter and allow more complicated layouts, but for years after CSS was accepted as a standard, web designers were stuck using the older, more troublesome table based designs. With the decline of Netscape that preceded its eventual demise, it was clear that Microsoft were in the driving seat of website design. From 2002 many web designers created websites aimed only at IE5.5 and IE6, by this point IE had become mostly CSS compliant. Anyone attempting to design to official W3C standards, was asking for trouble and many headaches. Then the second browser war started. Firefox was more standards compliant than IE, which meant that website designers had another browser to consider when designing a website, especially as Firefox became instantly popular and standards compliant websites were back in vogue. Many designers were therefore creating W3C compliant websites, and uncovering the power of CSS. But upon viewing them in IE, they'd discover things like the double margin bug, three pixel bug, float drop problems and also the fact that IE6 doesn't handle transparent PNGs. More than a few of them were scratching their heads and wishing 'If only IE were like Firefox!' With the popularity of Firefox soaring, accounting for 21% of the browser market by the end of 2008, it seemed that Microsoft heard. There are workarounds and so called hacks to get websites to look in IE6 as they do in Firefox but they were a hassle and meant much fiddling on the part of the designer. 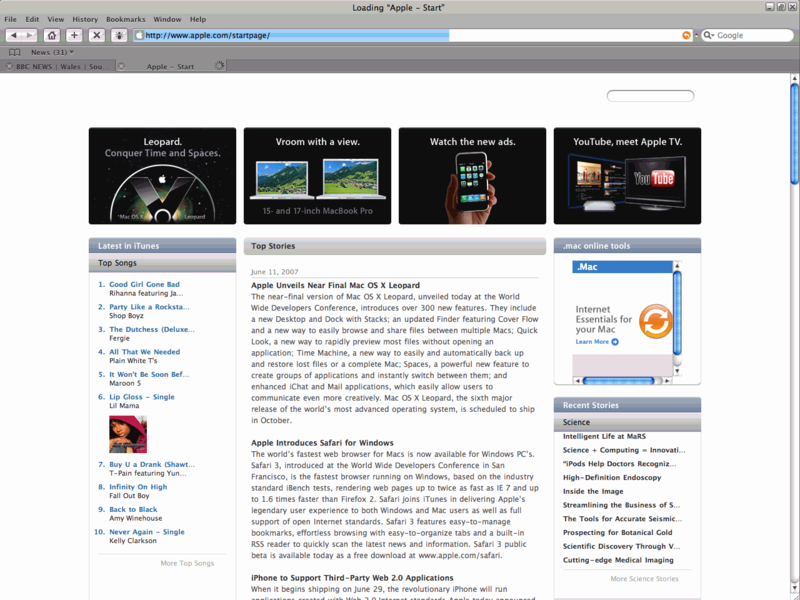 Firefox and Apple's Safari were far more forgiving and getting more and more popular with users, in response Microsoft released IE7. Although still not fully standards complaint, IE7 was the most compliant browser yet and Microsoft promised to go even further with IE8. IE8 is fully standards compliant, but after a decade of IE only designs, that may not be a good thing. If your website is fully standards compliant, or was aimed primarily at Firefox but with a few IE hacks, you should be OK, but if it was aimed mainly at IE6, you may have problems. It is certainly worth checking out IE8 to see what your website looks like as you may find, particularly if it is a few years old, that is doesn't look as good as it did. It seems that Microsoft have delayed IE8 to allow businesses to do precisely this. Microsoft did see this problem coming and have added two viewing modes for IE8, the default mode which is the standards compliant viewing mode and compatibility mode, which allows the user to view the website as if viewing with an older version of IE. Sadly though, few people are switching modes, meaning a lot of websites are not displaying correctly in IE8. Although this may not be too much of a problem at the moment, especially with Microsoft's delaying the release of the browser, it could become a problem very quickly. Although it was released only two years ago, IE7 accounts for 50% of the browser market, the previous version, IE6 just 20%. Two events this year are likely to push the uptake of IE8 to be faster than that of IE7. 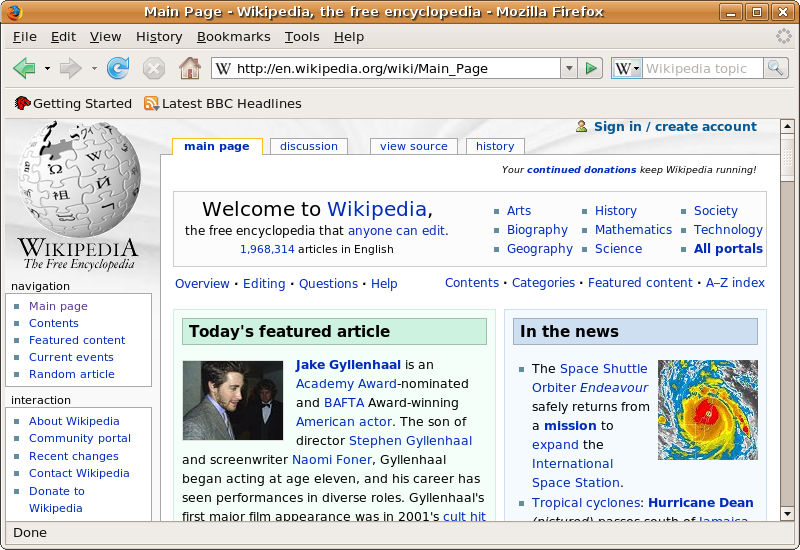 The release of Windows 7 later this year, which will most likely ship with IE8 as standard and also the fact that mainstream support for Windows XP ends in April 2009. Those buying a new PC will have the choice of Vista, or Windows 7, both of which will likely have IE8 as their default browser. If you're not sure what your website will look like, you can use this website to preview your website in IE8 (and other versions of IE) for free. 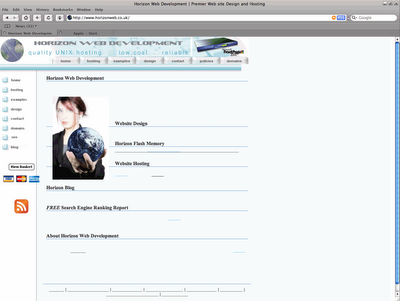 Needless to say the Horizon Web Development website and the Horizon Flash Memory website display perfectly. Many people ask for flash based websites, believing them to be the best way of impressing visitors, having a professional and modern looking website and also giving visitors an interactive, and easy to use, browsing experience. Whilst some of the above may be true, there are two areas in which Flash based websites lose out - accessibility and rankings. The importance of search engine rankings should not be understated, after all, what use is a website if no one can find it. "While our spidering practices may change in the future, we find that Flash is not a very user-friendly experience in a lot of ways. It is wholly inaccessible to the sight-impaired, not renderable on many devices (such as phones, PDAs), and so on. In particular, we hugely frown upon navigation done exclusively in Flash." I have seen many sites fall into the trap of using flash completely, some do have a HTML site too, most do not. Using flash for the site navigation not only means that Google may not like your website as much non-Flash sites, but it may also mean that Google is unable to find and index anything other than your homepage. It also means that those using mobile phones, PDAs and screen readers will be unable to view your website, let alone navigate through it. This wasn't much of a concern in the past, but with most mobile phones been web enabled, you could be cutting out a large portion of visitors. While things have improved regarding search engines, notably Google, since this email was sent, the fact remains that if two exact sites were made, one in flash, the other in CSS and HTML, the CSS and HTML site would be ranked higher. This is an important point to consider, particularly for small and medium sized businesses. These businesses don't have the kind of income to spend on teams of SEO specialists to get the best rankings, unlike the big companies that they may be competing with. SMBs are going to be paying quite a bit of money just to get decent rankings, so anything that could count against them should be avoided, and whilst non-Flash website may not look as attractive or as flashy; SMBs need to get the best possible rankings from their content. It is probably best to think of Flash like pictures, they may look great but you really wouldn't want a site made up entirely of pictures, unless you're comedian Jerry Sadowitz. Apart from taking far longer than text to load, even if a picture contains text, it can't be read by the search engines. Jerry Sadowitz's site for instance has only these words associated with it: Jerry Sadowitz - Comedy, Magic and More, and only those words as they are the title to every page. The search engines don't see pictures, they only see text, so an all picture site such as that of Jerry Sadowitz is virtually blank. Pictures should be used to complement the site content (text), not replace it. The same goes for Flash, it should have a place on a website but should be used sparingly and not as a replacement to a website. It is possible to get a great looking site through CSS and HTML alone, and then of course any amount of pictures and Flash can be added to complement that. Although it may change in the future, CSS and HTML is still the best way to tick all the relevant boxes when it comes to your website. We've made some changes to our website here at Horizon Web Development, our hosting packages have been revamped and we now have an automated set up in place meaning you can buy your domain and hosting at once and set up your website immediately. If you are looking for a domain name look no further than our new domain name look up feature of our website. Here simply enter the name you would like to register, all available domains will appear on the following page along with prices and registration periods. Simply tick the box to add the domain name to your basket. If you already have a domain name registered with another company but are interested in our hosting packages, simply enter your domain in the second box on our hosting package page here. You do not need to transfer your domain over to us to use our hosting packages. We offer some great web hosting packages, with our Starter Package at just £14.99 a year (£1.25 per month) and with more features than many of our rivals business or professional packages. Simply visit our hosting page to view what we have on offer. If you see a better like for like hosting offer elsewhere in the UK, let us know and we'll match it for you. 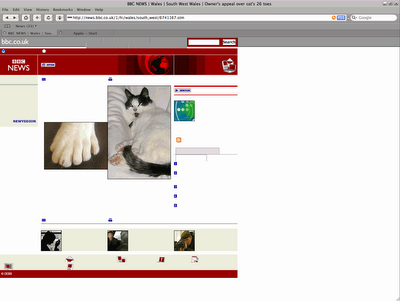 This past week has been a sad week for web users, with the final death knell for Netscape. For some it is a sad day and the end of an era, others would say a well flogged old horse has been finally put out of its misery. When I first starting browsing the web there was really only ever Netscape, it was launched in 1994 and dominated the browser market for most of the nineties, offering better features, faster browsing and generally being more advanced than any of its competitors. For most internet users today that probably seems pretty hard to believe, but there was an internet before Microsoft Internet Explorer, which itself wasn't launched until 1995 and didn't really start to compete with Netscape until version 3 (IE3), released in 1996. At its peak in 1996 Netscape accounted for 90% of the browser market (at the same time IE had about a 4% market share). Netscape just had more to offer back then, it was a full internet suite with a built in mail reader, very similar to Mozilla Thunderbird of today, a WYSIWIG HTML editor, that surprisingly at the time was a pretty good match for Microsoft's paid for, Frontpage. For me Netscape Communicator 4.7, released 1999, was the one that remember most, chiefly because it was the one that I used the longest and also because it was just about the last version of Netscape that I used as my main browser. 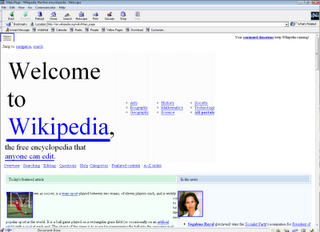 This was the peak of the so called 'First Browser War' and unfortunately Netscape dropped the ball. 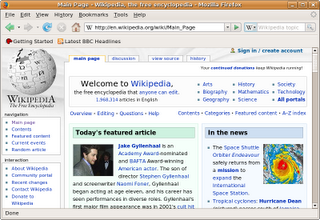 Netscape 5 was in development for a long time, before finally being scrapped. By the time Netscape was purchased by AOL and work began on Netscape 6, Internet Explorer 5 was out (1998) and it pretty much signalled the end of Netscape. By version 5.5 in 2000, I too was using Microsoft Internet Explorer. To be fair to Netscape, Microsoft always had the advantage, not only were they a huge company, they accounted for around 90% of the operating system market and so included IE with the operating system. Few people felt the need to download a new browser when one was already included with the OS, particularly during the days of dial up. By the end of 1998 IE had a 50% market share, Netscape had dipped below 50% for the first time. Netscape 6 arrived in 2000, I used it but unfortunately it was a bug ridden flop and so IE5.5 became my browser of choice, as it did for most people. By 2001 Netscape had just 10% of the market share and the browser war was over. Personally I was glad to see the end of the browser war, not just because it meant that I had just one browser to choose from but because it made website design easier. 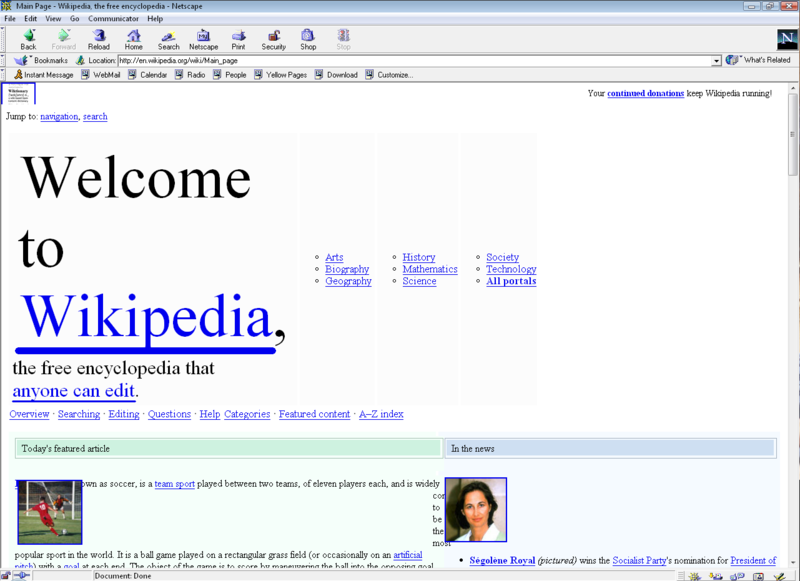 During the browser wars, website design became a nightmare. Netscape and IE followed their own, mostly incompatible rules, meaning that it was extremely difficult to get a website to display properly in both browsers. This was of the course the days of the 'Best Viewed In' banners. Things were able to move on once again in website design, after the several years of stagnation during the browser wars. I did download Netscape 7 in 2002 and even Netscape 9 in 2007, but just for nostalgia really. They were unimpressive and so seldom used. By then I had been using Mozilla Firefox for 3 years as my primary browser. With Firefox, Mozilla had done what Netscape had failed to do since the mid nineties, produce a ground breaking and advanced browser, which revitalised the browser market. At the time of my switch to Firefox, Netscape accounted for less than 1% of the browser market and to all intents and purposes, was dead in the water. Whilst I agree that perhaps the end of Netscape is long overdue, it is sad that the only browser that truly matched IE, is no longer with us. Although a far better browser, Firefox only accounts for about 18% of the browser market share, and will take years to chip away at Internet Explorer's huge lead. I was quite pleased yesterday, I discovered that Apple have released an update for Safari making it Safari 3.0.1. At last I thought, I will be able to use Safari! I was wrong. 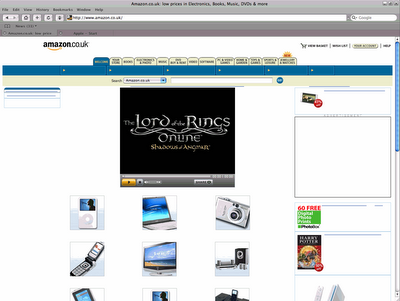 Still the same problems persisted, missing text on sites such as BBC News, Amazon, Horizon Web Development and so on. Oddly Horizon Flash Memory is fine, so if I want a new SD card I can use Safari, anything else though and I have to use Firefox. I am surprised that they have released an update but not sorted out, what must be for most people, the biggest problem with Safari, they can't read the pages. I hope that they sort it out soon, otherwise this Safari hype could run out of steam and lose all those potential users, myself included. Many designers, be they graphic designers, desktop publishers or web designers have Macs. Not just because they are cooler but also because things seem to just look better on a Mac. I have noticed the same thing with websites viewed on the Mac and as a web designer realised that it may be worth getting one. Well Apple have solved that problem for those web designers who use Windows, with Safari for the PC. Safari for Windows has been released today and I couldn't resist taking a look, and unfortunately I was disappointed from the off. Firstly I had garbled text. A quick Google, well found nothing as the browser was only released today but I did manage to discover that it was something to do with the font Lucida Grande and that I should uninstall it and then reinstall the one that came with Safari. Very annoying and I was very close to just removing the browser, but I persevered, I opened my Control Panel, clicked the Fonts folder and deleted both Lucida Grande fonts that I had there. Then I went to the Safari folder (C:\Program Files\Safari\Safari.resources) and copied the two Lucida Grande files there into my Fonts folder and that got it looking normal. I admit I was impressed with the look and speed of it so I thought I would try another site so just for fun I thought that I would visit the BBC News website and this is what I saw! Oh dear. 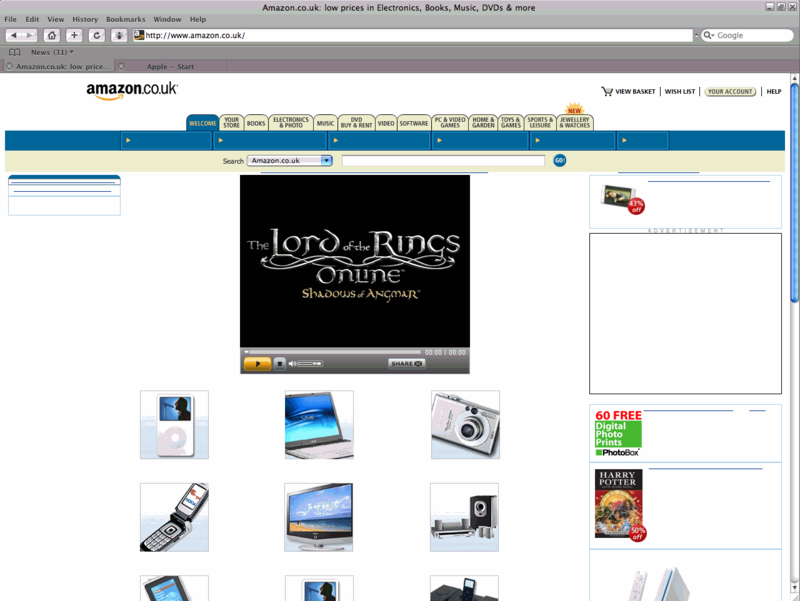 Trips to Amazon.co.uk and Play.com produced similar results and so in the end I gave up. Not only can I not use this browser for fun but testing web sites in this browser will probably lead me to try and correct problems that don't really exist. Back to the drawing board for Apple and back to Firefox for me. Be Ranked No.1 on Google! "We can guarantee to get your site a Top Ten ranking in Google, MSN, Yahoo, and Lycos…." I get emails like the above quite a lot, usually I can't go a week or so without having some random company sending me an email guaranteeing that they'll get my site ranked No.1 in Google, or even just the Top Ten for the less optimistic ones. The fact is that no one can guarantee any kind of ranking on Google and the other search engines, not a top ten ranking, and certainly not the prized No.1 position. Many of the so called SEO (Search Engine Optimisation) specialists that send these emails are just after a quick buck. Some won't even attempt to get you higher others will get you ranked for a keyword or phrase that you are already highly ranked for, such as in our case Horizon Web Development, which we are already in the top two for, as you can see here (I'll save you having to type in "Horizon Web Development"). Others use unscrupulous tactics that could get you banned from Google and other search engines, typically after you've paid. A common tactic is what is known as keyword spamming or keyword stuffing whereby they literally cram your pages with keywords in lists or in such a way as to make sections of your site unreadable. Tactics such as this usually work quite well at first, normally right up until after you've parted with your cash and thanked them for the good work, and then get you banned. A famous US company that employed unscrupulous tactics is the one mentioned in this article. Always check out their website and find out how well it is ranked. Carry out a quick Google search to see if you can find recommendations or complaints out there from any of their previous customers, or to just get a general idea of their reputation. If they have a list of previous clients, contact one or two to ask what they thought of the company. Ask them what they are going to actually do to get your site better ranked. Never hand over control of your site to a company without knowing exactly what they are going to do. Ask for a detailed invoice so that you can clearly see what your money has got and don't let them blind you with jargon. Finally make sure that you check to ensure that they've delivered what they have promised, preferably before you pay! At Horizon Web Development we design our websites with Search Engine Optimisation in mind and are always on hand to offer advice of keywords, SEO, rankings and search engines.